If you are looking for render of "The Great Pumpkin" that is true to Charles Schultz's vision, try here. I'm sure Linus imagined all sorts of things sitting out in the pumpkin patch however, and perhaps one of his flights of fancy looked something like this... 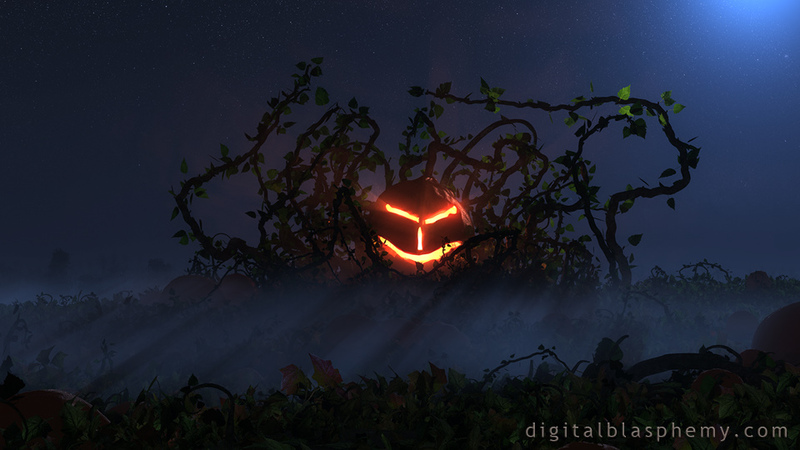 The jack-o-lantern was modeled using Zbrush (though most of the details ended up getting glared out). 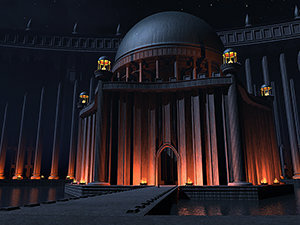 The vines were modeled using e-on's wonderful Plant Factory. "Late comment - but still needed"
It just occurred to me I might have forgotten to write a review on this particular piece of art. I've LOVED it all these years! I also really like how you posted the various progressions of the piece as it developed. As if you were watching the Great Pumpkin grow. I love this, it's dark and evil and all about Halloween. It doesn't need to be scary, it's about Ryan's perspective. Awesome! Fabulous - the aura makes it seem more mystical, like it's got energy (spells?) waiting to be released. I love the ominous glow emanating from the face. The vines remind me of the forest scene in original Evil Dead movie. Very dark. Love it! The original was good, but with the face and a more distinct focal point, makes this even better!!! 9/10. I like the new v2 render, but I'm sticking with v1 because of the framing on the dual-screen. On my 3840x1200 setup, the focal point is split between the two screens. 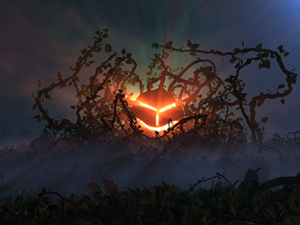 Love the sinister pumpkin! I am not familiar with Charlie Brown, but regardless, I love the atmosphere of this scene. This one looks more like a storm trooper from Star Wars than something in a pumpkin patch. Either way, this pumpkin is one to keep away from! I think that this one should be taken for what it is--a fun Halloween wallpaper. I think it's a blast, and will be using it for the season. Thanks, Ryan! This is exactly what I think of in the Great Pumpkin Charlie Brown. You've hit the nail on the head with this one. Love it!!! Way too bright, and the colors are washed out. The pumpkin face needs A LOT of work. Sorry, there was a glitch with the 16:10 files. They should be showing up now. Are you not doing that one anymore or did it just get missed.